INDIANAPOLIS, IND. 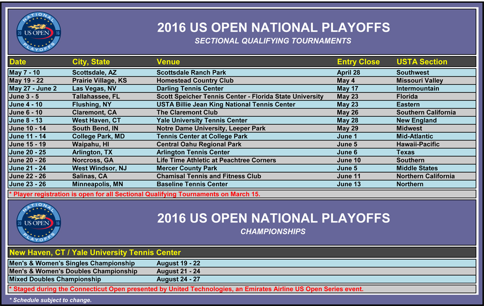 – Registration is now open for the US Open National Playoffs Midwest Sectional Qualifying Tournament to be held June 11-14, 2016. The event will be held at the University of Notre Dame and Leeper Park in South Bend, Indiana. Earlier this month, the USTA announced the return of the US Open National Playoffs for the seventh season, expanding the footprint of the US Open to South Bend by providing the opportunity for all players 14 years of age and older to earn a berth into all five draws at the US Open. Tennis players can compete in men’s singles, women’s singles, men’s doubles, women’s doubles, and mixed doubles. “We are very excited and honored to be hosting one of the US Open Qualifying events in South Bend! We are a proud and strong tennis community and are thrilled to showcase our local facilities, area attractions, and vibrant downtown,” said Meghan Huff, Sports Sales Manager with Visit South Bend Mishawaka. 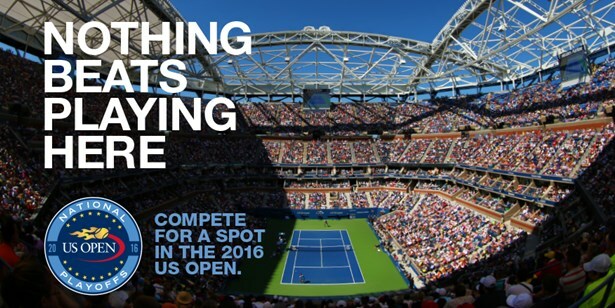 Registration opened Tuesday, March 15, at www.USOpen.org/NationalPlayoffs. The entry fee is $85 for men’s and women’s singles and $55 per player for doubles. All players competing must have a current USTA membership valid through August 29, 2016. More than 2,000 players competed in the 2015 US Open National Playoffs—the largest number of players ever. Players ranged from experienced professionals who were once ranked in the Top 50, to junior players and current/former college standouts, to recreational players of all playing abilities and walks of life. Participants included those competing for charity, businesspeople, musicians, lawyers, reporters, former athletes, and stay-at-home mothers.